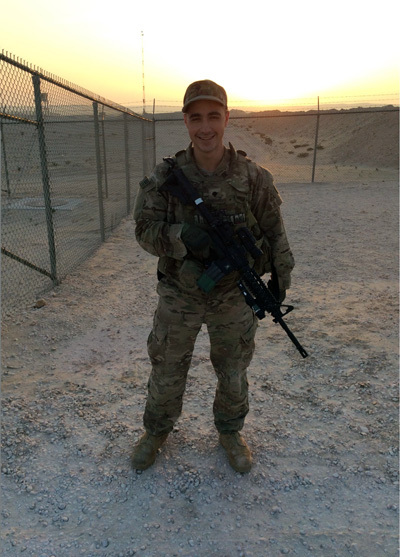 Bobby George '17 is spending what would have been his senior year deployed in Qatar on National Guard duty. 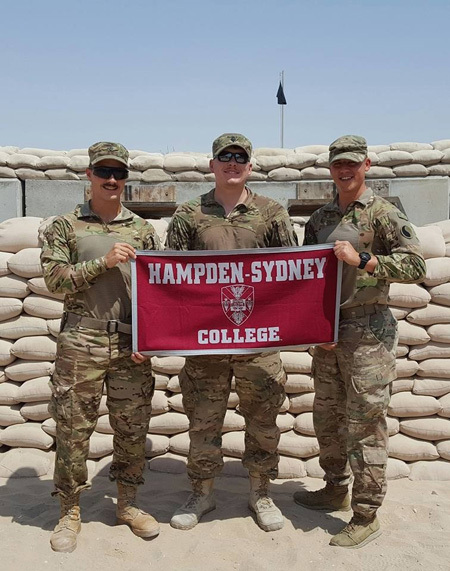 A Hampden-Sydney College flag hangs behind Robert "Bobby" George '17 as he prepares to begin a night shift on duty in a time zone eight hours ahead of Virginia's. Bobby sports a mustache and a military high-and-tight as he chats with Tiger News via Skype, a conversation that one year ago would have taken place in person. His presence here is proof that life does not always go to plan. A year ago, Bobby received a call informing him he would be deploying to Qatar just a few months later. With that, he packed his bags and prepared to depart-even though it meant taking a break from college during what would have been his senior year at Hampden-Sydney. Tasked with guarding military assets, the National Guard 116th Infantry Regiment - also known as the Red Dragons - will spend approximately nine months total overseas. Bobby, a foreign affairs major, admits that he was initially upset with the timing, but he has since discovered the experience to be a positive one. The deployment has allowed the platoon to see an alternative side of the military, which Bobby explained is different from the glory portrayed in the movies, but he has found it to be very educational. Bobby, who is a Specialist with the Military Occupational Specialty (MOS) 11B Infantry, has taken a company intelligence support team class in addition to training for the opportunity to compete for the expert infantry badge since he left for training in May 2016. The education he is receiving comes with a new environment. Bobby has relocated from an all-male school of his peers in rural Virginia to a base in the Middle East filled with people of all different backgrounds. There are individuals with college degrees and others who have never been interested in college, all of whom have bonded through their military dedication. Everyone at Hampden-Sydney made sure I left and could return in good hands. Although Bobby spends his time with many people with whom he has developed a strong sense of comradery, it does not prevent him from longing for home. "I miss my family, my pets, and the commonality that you experience by being home," he says. The assistance of the Hampden-Sydney community made Bobby's transition to deployment easier. Despite the unconventional situation - his leave is not a part of Hampden-Sydney's curriculum or programs - professors and staff worked to ensure the logistics lined up. "Everyone at Hampden-Sydney made sure I left and could return in good hands," says Bobby. In addition to the help received from faculty and staff, Bobby found encouragement and emotional support from the brotherhood of Hampden-Sydney. He explained, "It's one thing to say it, to read about it, or to experience it on the Hill; when you're away and people back home reach out to you, you realize the brotherhood truly does exist." As a Pennsylvania native, Bobby discovered Hampden-Sydney by chance. Originally intrigued by the all-male nature of the College, he chose to visit. He loved the campus and the people he met, but the Honor Code sealed the deal in the end. Bobby explained, "I wanted to be at a school where students took pride in themselves and others in the community." Bobby's influence in the Hampden-Sydney community during his first three years was extensive, which he contributes to the ease of getting involved on campus. He represented his class on the Student Court and was treasurer of the Union-Philanthropic Literary Society, in addition to being president of Cogito, a religious club. Bobby is also a brother of Pi Kappa Alpha and was a member of the Garnet and Gray Society, a College-sponsored leadership organization, as well as an opinion writer for The Tiger. When asked what he missed most about being on campus, he replied with a chuckle, "I don't think I'd say this freshman to junior year, but I miss classes the most." 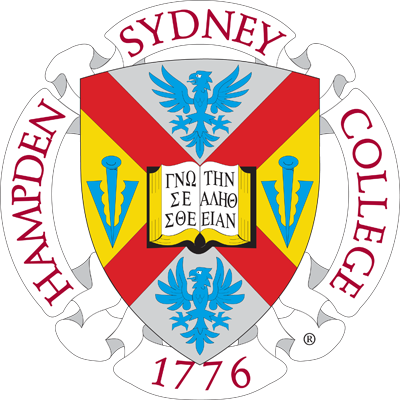 The lively discussions and critical thinking are some of the characteristics of a Hampden-Sydney classroom that he eagerly awaits. If everything goes according to plan, Bobby will return to campus in the fall to complete his senior year. He is excited to return to campus, to family, and to fried chicken on Wednesdays in the Commons.